The ProForm Pro 7000 treadmill gives you excellent performance and lots of workout options in a machine packed with extras to make your workouts more enjoyable. With 36 workouts divided into four categories, you can definitely find your workout sweet spot on the Pro 7000, and the oversized, full color monitor turns your treadmill into an entertainment center. UPDATE: The ProForm Pro 7000 has been discontinued and replaced with the all new upgraded Pro series models. Check out the new Pro treadmills from ProForm including the 2000, 5000 and 9000, all solid machines for the price. Because ICON Fitness backs the ProForm Pro 7000 treadmill with excellent engineering and outstanding quality on all parts, including the motor, rollers and bearings, this is a machine that's getting some great reviews from experts who have dared to compare it to similarly priced models by Precor and Smooth, both leaders in the high-end treadmill market. 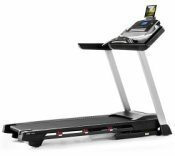 Most reviews of ProForm treadmills focus on the many positive aspects of their mid-range models, but we've recently seen more interest in their pricier models, including this one. Although not many reviews mention it, we are actually most impressed with the built-in programs on the Pro 7000 treadmill. The 36 programs are divided into 9 workouts each for calorie burn, intensity, speed and incline/decline. 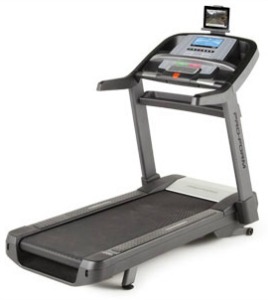 This is a top quality treadmill that can truly be all things to all users, especially with the quick speed and incline/decline adjustments to keep you on your toes. The generous belt size and 375 pound weight capacity indicate ProForm's renewed focus on durability and performance. The 10" monitor is one of the best we've seen on any treadmill and lets you take advantage of the innovative iFit training interface and Google street views to liven up even your most grueling workout. 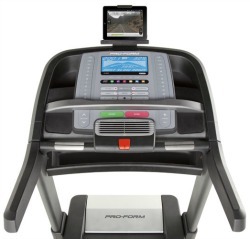 If you see the ProForm Pro 7000 treadmill on sale for $1800 or less, it will hold its own against other premium brands selling for up to $500 more and has a generous warranty to back it up.